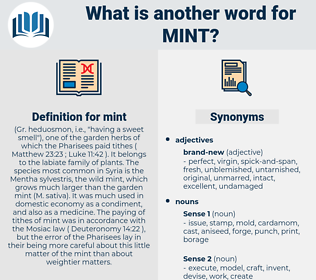 What is another word for mint? ( Gr. heduosmon, i.e., " having a sweet smell"), one of the garden herbs of which the Pharisees paid tithes ( Matthew 23:23 ; Luke 11:42 ). It belongs to the labiate family of plants. The species most common in Syria is the Mentha sylvestris, the wild mint, which grows much larger than the garden mint ( M. sativa). It was much used in domestic economy as a condiment, and also as a medicine. The paying of tithes of mint was in accordance with the Mosiac law ( Deuteronomy 14:22 ), but the error of the Pharisees lay in their being more careful about this little matter of the mint than about weightier matters. make up the top of head. old, ancient, used, imperfect, damaged. broken, marred, blemished, hurt, soiled, faded, hand-me-down, polluted, harmed, well-worn, defaced, spoiled, shopworn, disfigured, stale, sullied, tainted, second hand, injured, contaminated, bruised, impaired, defiled, worn. ruin, take, demolish, destroy, tell truth, break, raze, lose, dismantle. I have cold lamb and mint - sauce for our early dinner. But the mint stood stiff and still, and at last said: Friendship - but nothing more! man-made, monet, matted, mood, mat, mutate, monad, mahout, mt, monnet, moth, monday, minuend, monied, math, mediate, method, mediated, mantua, md, minutia, meet, memento, may day, manhunt, meed, matai, meat, meadow, matey, mete out, maidhood, mentha, meade, mandate, mount, mohammed, muddied, manda, mahomet, mite, moat, minuit, manhood, monody, meditate, med, mimidae, mut, minuet, motto, midi, month, manet, madia, manta, matthew, montia, mantidae, mennonite, monte, manned, mammoth, monument, Mohammad, midway, moneyed, mined, medea, moment, meted out, meaty, miniate, mad, mid, manumit, maund, manihot, mantid, mayday, motet, mote, momotidae, moot, mud, Mahdi, manteidae, MDI, mute, mahound, moated, made, Mothy, manteodea, myth, manatee, mayweed, minute, mind, maimed, minded, mouth, momot, mounted, muddy, manidae, matt, muhammad, maundy, manat, mammutidae, mitt, mountie, mode, midday, metadata, munda, mot, Mutawa, middy, mod, muted, mate, mamet, mead, matte, mediety, mound, mande, maid, mutt, mit, Mete, maidu, maenad, mated, minnewit, meth, moiety, moody, monod, mott, myoid, menotti, mend, mammut. Mentha Piperita, peppermint, spearmint, lemon mint, Mentha Longifolia, water mint, Mentha Citrata, eau de cologne mint, Mentha Arvensis, bergamot mint, Mentha Pulegium, Mentha Rotundifolia, Mentha Aquatica, pennyroyal, apple mint, field mint, Mentha Spicata, applemint, Mentha Suaveolens, water-mint, horsemint, corn mint. mint family, Lamiaceae, herb, family Labiatae, labiatae, family Lamiaceae, herbaceous plant.